In celebration of National Economic Development Week, Mayor Greg Fischer and Kent Oyler, president and CEO of Greater Louisville Inc., today announced that Louisville Forward, the city’s economic development organization, and Greater Louisville Inc. (GLI), the region’s chamber of commerce, have been jointly recognized as a Top U.S. Economic Development Group for 2017 by Site Selection magazine. This is a back-to-back win for the two organizations. Working together in 2017, with partners in two states and 15 counties, these two groups have helped the Greater Louisville region attract 62 projects, representing more than $1.7 billion in investment and nearly 6,000 jobs. GLI attracts leads looking at the region and transitions projects to the local economic development organization after the company has narrowed its search. As the economic hub for the region, Louisville Forward had a banner year in 2017, locating 57 projects in Jefferson County, representing $1.68 billion in investment, and 5,096 new jobs. Louisville Forward also celebrated Passport Health Plan’s $130 million expansion and relocation of its headquarters to west Louisville, Ford’s continued commitment to the city with a $900 million investment at its Kentucky Truck Plant, and Diversified Consultants Inc.’s initial location and expansion into the Louisville market with a double-down on investment totaling nearly $20 million and creating 1,000 new jobs. “For the second year in a row, GLI is proud to share this prestigious award with our regional partners and Louisville Forward. We are clearly making an impact with our collaborative efforts around economic development. The future looks bright for our region and we will continue working together to attract even more employers to our 15-county region,” said Oyler. In 2017, GLI assisted its partners in locating 12 projects for the 15-country region, resulting in projects representing $73.4 million in investment, and creating 809 jobs with an additional 25 referrals that resulted in seven locations, 556 jobs, and $21 million in investment. The region also hosted its first ever Familiarization Tour for 10 national site selectors with the assistance of the Advance Greater Louisville Regional Partners. 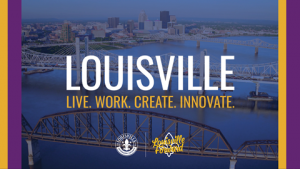 Louisville Forward was formed in July 2014 to unite economic development efforts and built environment functions, allowing business owners to go from concept to permit in one streamlined agency. To achieve its goals of raising the median wage across the city and growing the number of jobs, the Louisville Forward team focuses on five strategic business categories that are historic and contemporary areas of strength to Louisville: Advanced Manufacturing, Food and Beverage, Lifelong Wellness and Aging Care, Logistics and eCommerce, and Business Services. Since its creation, Louisville Forward has helped businesses create nearly 22,000 new jobs in Louisville, representing an investment of $5.2 billion dollars. This award marks the fourth straight year that Louisville Forward has been recognized by Site Selection magazine. GLI is focused on growing the regional economy. As the region’s largest convener of business leadership, GLI leads global economic and outreach strategies focused on business attraction; nurtures the entrepreneurial eco-system; and champions the development of the community’s talent base. As the voice of Greater Louisville’s business community, GLI advocates for a pro-business environment and facilitates businesses engagement on issues that impact regional competitiveness. Site Selection magazine’s recognition is based on six criteria – total projects, total investment associated with those projects and total jobs associated with those projects; and those same three numbers calculated per capita for the metro area. “Greater Louisville’s economic development success comes from a sense of all-for-one and one-for-all that transcends jurisdictional and organizational boundaries. Companies and institutions collaborate, corporations and startups convene, cities and even whole states cooperate and converge on challenges and opportunities as they arise,” said Adam Bruns, Managing Editor, Site Selection magazine. Ford Motor Company – continuing its commitment to Louisville, is investing $900 million in upgrades to the Kentucky Truck Plant to prepare it to manufacture the new Ford Expedition and Lincoln Navigator. This investment is in addition to the $1.3 billion investment and creation of 2,000 jobs announced in 2015. Aravato Bertelsmann – is quadrupling its logistics capacities with a $5 million investment, creating 250 new jobs. ResCare – founded in Louisville in 1974, this leading health and human services provider is building its $34 million headquarters at the Shelbyhurst Office and Research Park, creating 200 new jobs. W.W. Grainger – a Fortune 500 company, is investing $273 million for a large distribution center in south central Louisville. The company plans to grow 500 new jobs with this attraction project. For more information about Louisville Forward, visit http://louisvilleky.gov/louisvilleforward. For more information about GLI, visit http://www.greaterlouisville.com.